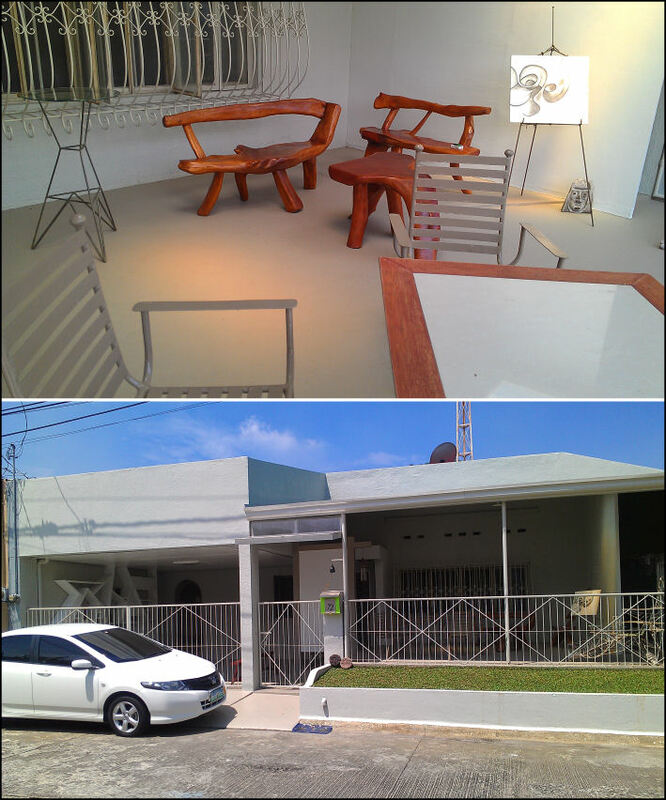 Our one-month September visit led to this GlenLornDave BF Homes Gallery-Studio Renovation, its front roof and interior. 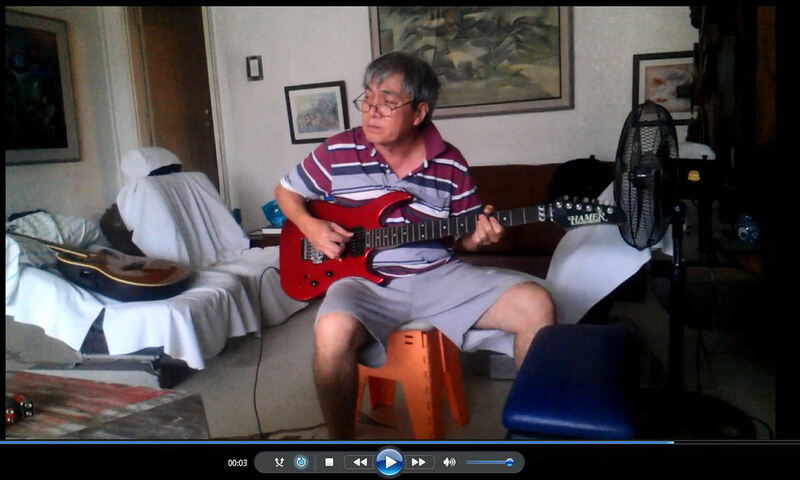 I would sing with David’s Hamer red guitar to relax and at the same time entertain the workers during break time. Here’s David’s video of me singing . . . 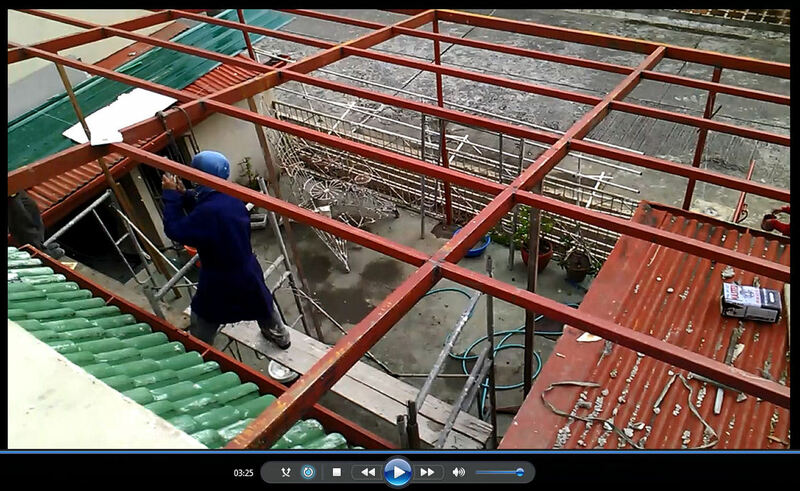 Image above: The green and red roofs were taken down shortly before the higher, new wide roof was installed. 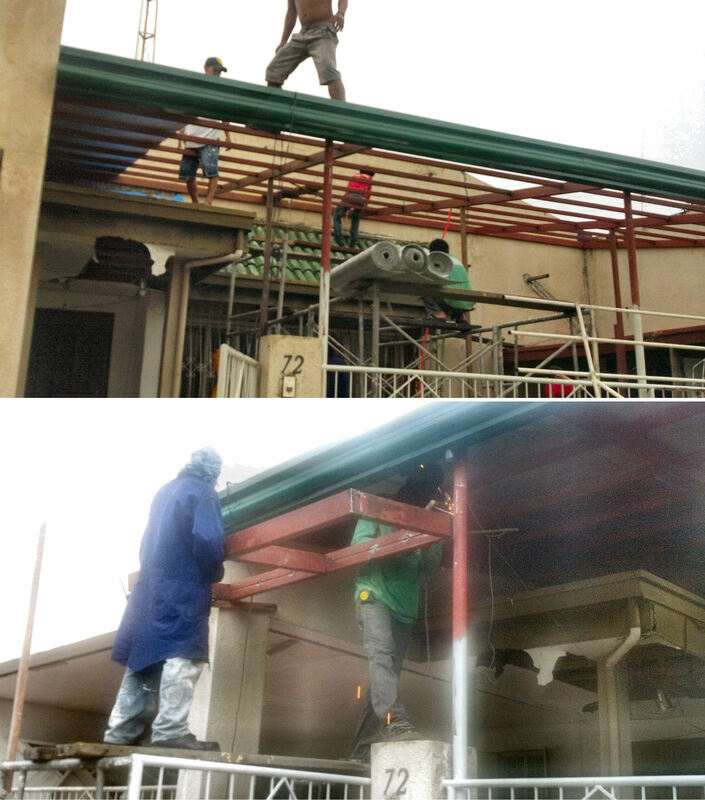 We were all delighted about this roof improvement. Dan Bautista: looks nice uncle. i have a lot of fun memories in this house. i miss it! Sonny Zandueta: Ahhh…. Good memories here. I thought I developed muscles grinding those litho limestones! Friendship…Art…..Music… unforgettable. 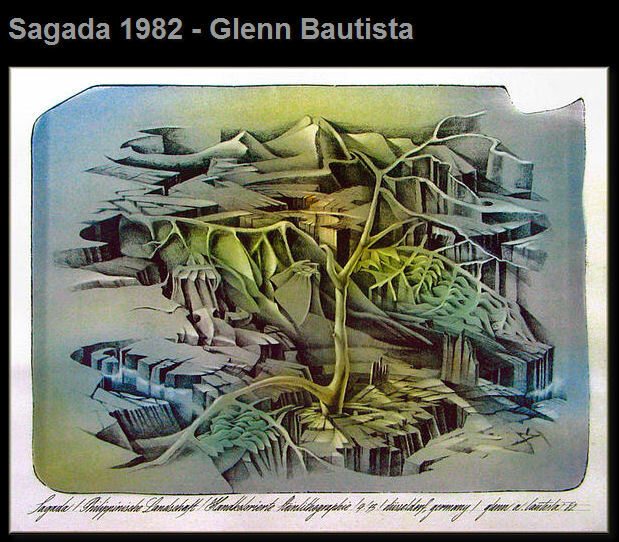 January 1977 / Size:8″x10″ – An etching I did with Rey Rodriguez based on Betsy Francia‘s poem, “Water Temple” during the 1976 meditation years. Somehow, one day, I bumped into Rey Rodriguez at Sining Kamalig where I had the chance to talk to him about printmaking. 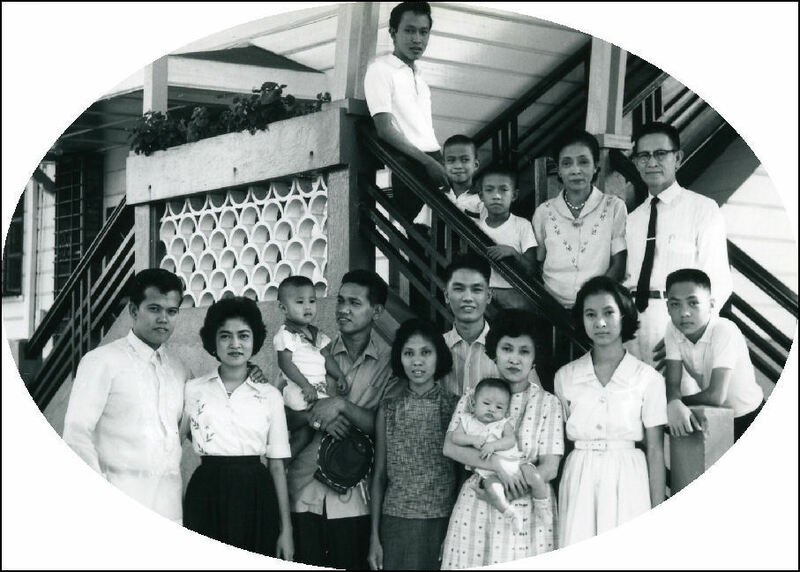 Anybody in the visual arts field would know not only Rey Rodriguez, but much more about the father and Boy, Rey’s elder brother. 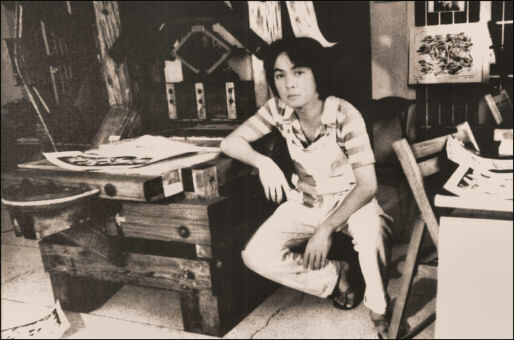 Printmaking in the Philippines would not have been launched had it not been for Mang “Maning” as many lovers of the medium fondly call him. 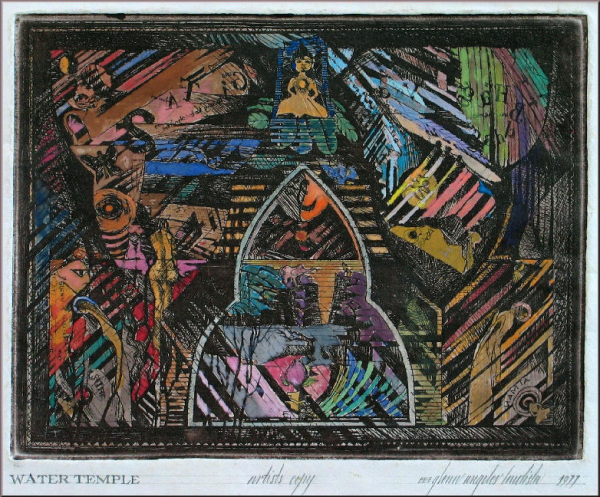 Manuel Rodriguez, Sr., is the Father of Philippine Printmaking. 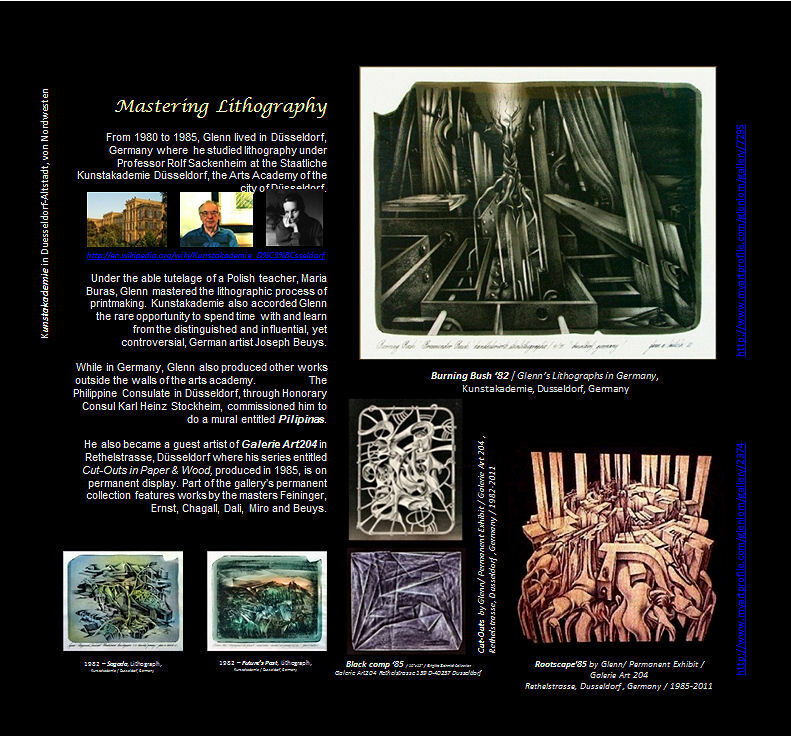 In brief, I got into printmaking because of Rey Rodriguez. He was what I call the “great encourager”. 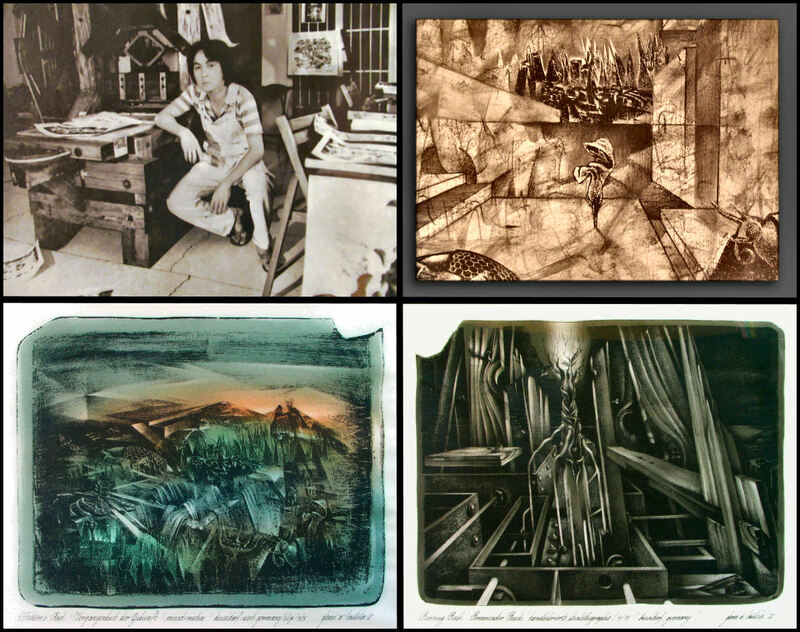 He didn’t seem to lose patience when I was trying to learn how to etch using a zinc plate and other forms of printmaking. One thing led to another. Not too long from my printmaking sessions with Rey, I got to meet Lito Mayo, another great printmaker I was fortunate to have met. Above, is one of the few etchings I did with Lito Mayo. 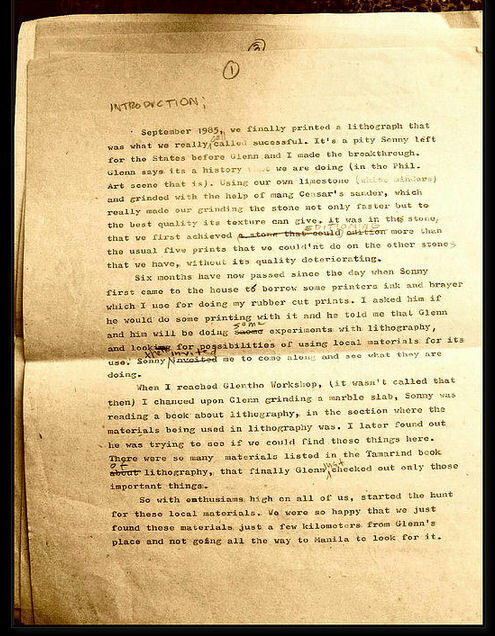 Here’s and excerpt from an article about Mang Maning: . 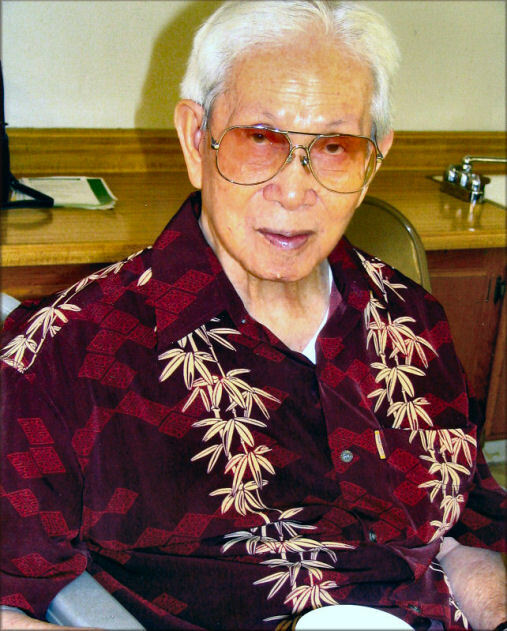 “The 99-year-old man I met at 856 G Gallery last March happened to be an artist, and not just any artist—he is the Father of Philippine Printmaking, Manuel Rodriguez, Sr. Along with my students who came with me then, I knew, therefore, that the opportunity of being with him and learning from him might not present itself again. Encountering a person who is almost a century old is very humbling. It is like opening the book of his personal experience; going through the pages, you grow all the wiser. • Glenn Bautista: Hi Pandy, RodS, TonyG, Fil, can you help me identify all those members present at this Printmakers’ Association of the Philippines meeting? 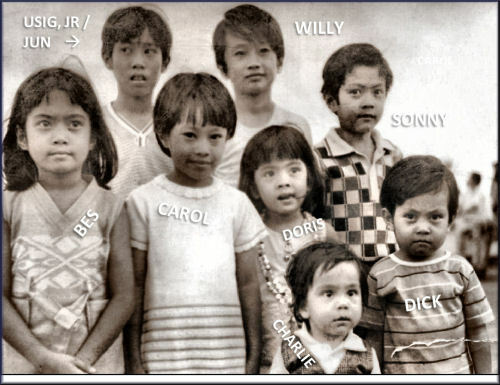 I recognize Fil de la Cruz, Pandy Aviado, Adiel Arevalo, Ben Cabrera, Tony Gonzales, and are those Tes Pasola and Eva Toledo? 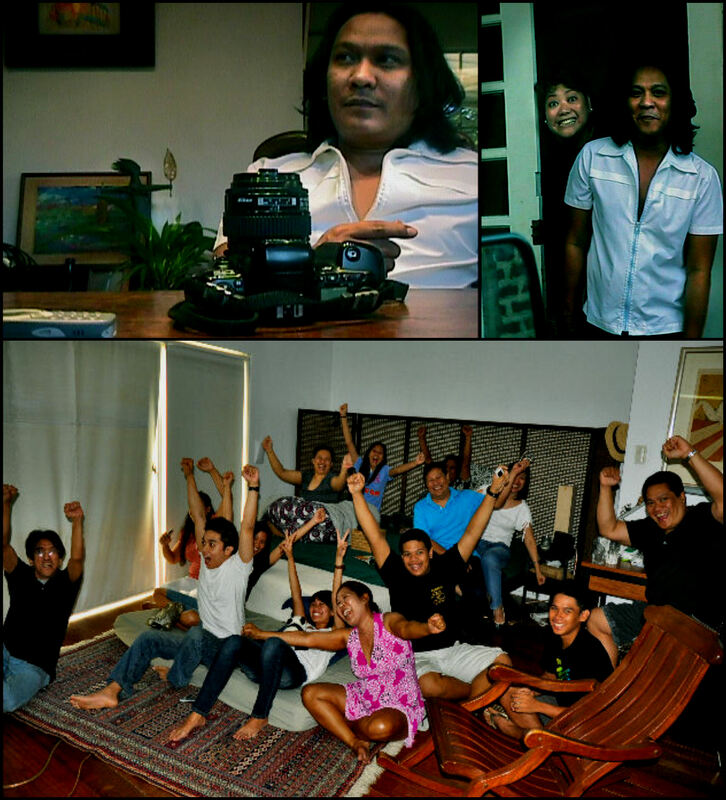 And this was at Adiel’s place in Malate, right? The rest, I cannot place . . . — with Nunelucio Melocoton Alvarado, Tes Pasola, Boy Gozum, Maida Sobretodo, Fil Delacruz, Adiel Arevala, Benjie Cabrera, Caridad Arguelles, Alan Rivera, BenCab and Antogon Gon. 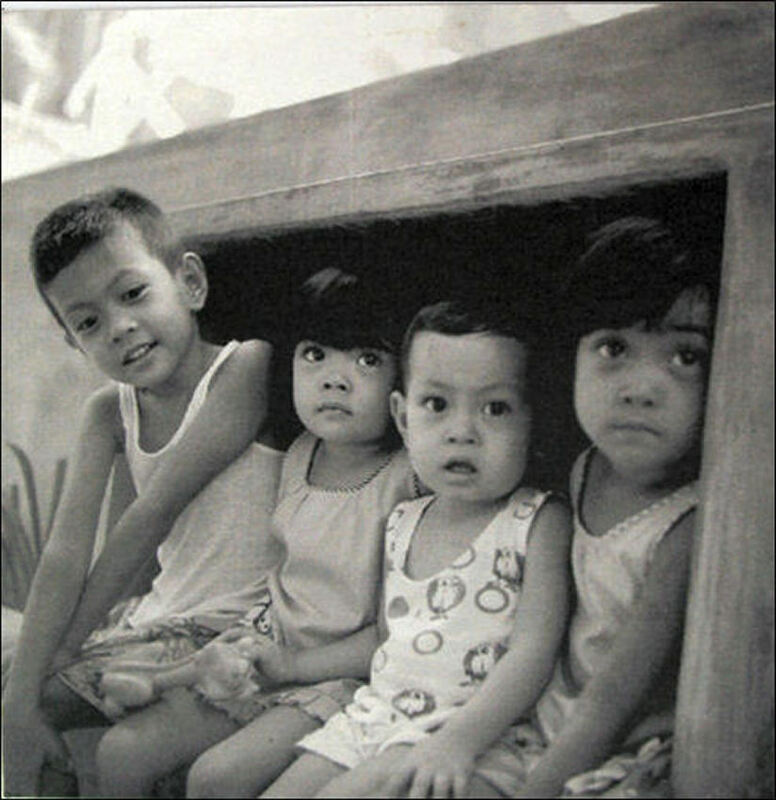 • Rodolfo Samonte: GlennBro, next to Pandy, on his left the other BenCab, hehehe, Benjie Cabrera. That’s not Eva Toledo Eva Laird Smith). 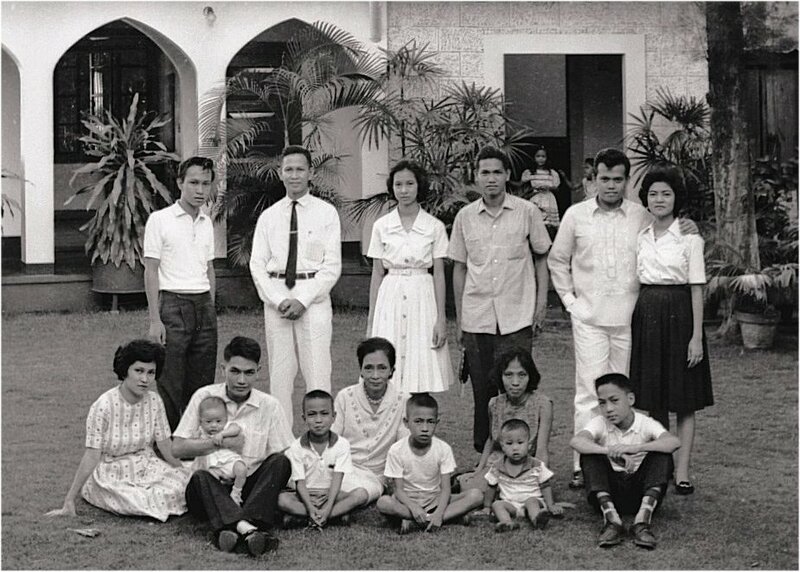 Parang si Nunelucio Melocoton Alvarado yung leftmost standing, pero not sure. 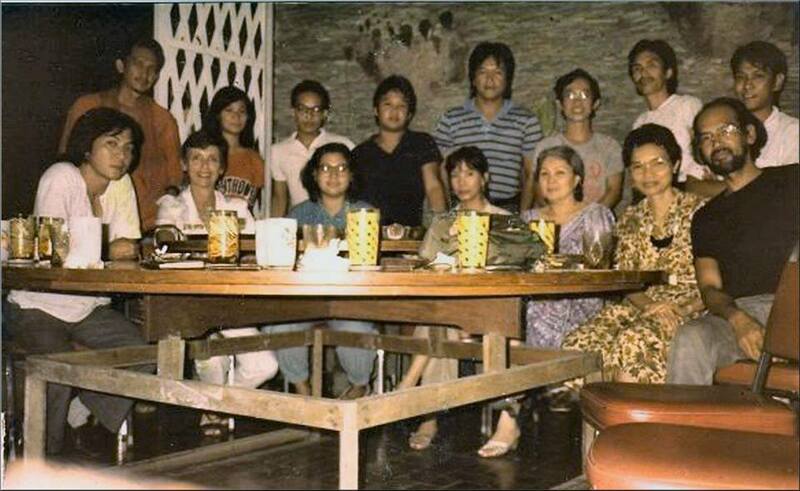 Hindi ba si Brenda Fajardo yang sitted in front, 3rd from left? • Rodolfo Samonte: si Boy Gozum nga katabi ni Fil dela Cruz. • Rodolfo Samonte: Sino yang between Bencab and Adiel? Laging nasa meetings siya, but I don’t think I ever got to know her name. • Rodolfo Samonte: Si Boy nga yan, mas shorter pa kay Pandy, hehehe, but a little wider now, LOL. • Pandy Aviado: between Ben and Adiel is Caridad Arguelles. Next to Adiel on her right is Maida Sobretodo then next is Tess Pasola. Behind Ben is Tony Gonzales, the papermaker. • Fil Delacruz: yes glenn,sa residence ni adiel ito, si nuni alvarado nga yung nasa likod sa kaliwang side. • Glenn A. Bautista: Thanks, Pandy. After Nune are three yet to be identified. I have tagged the rest. • Glenn A. Bautista: Thanks, Pandy. 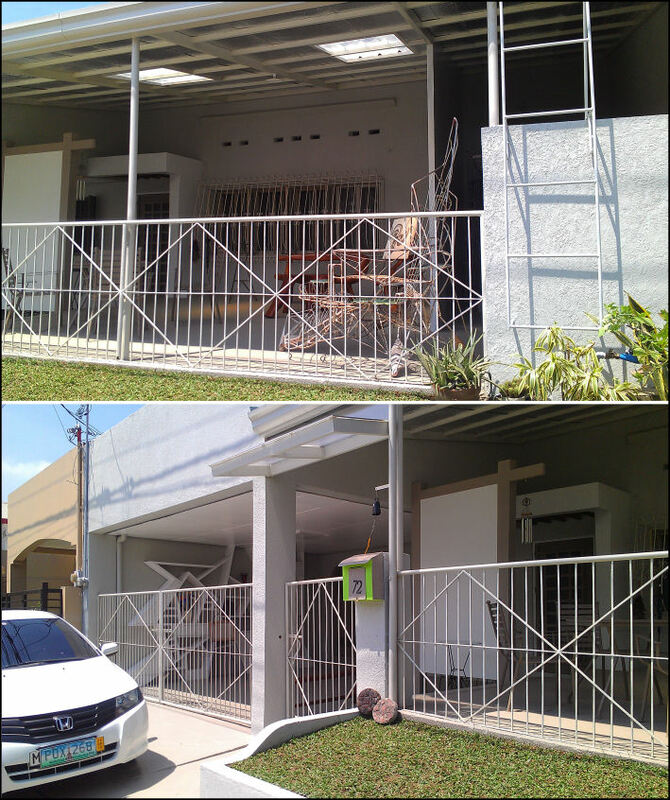 Btw, I included this in my blog, about the same time Tony Gonzales (Antogon Gon),Sonny Zandueta and myself were constructing the wooden lithography press at my place in BF Homes which I renovated last September 2012 when I visited my son, David. .• Pandy, just the names of Nune’s girlfriend and the lady in front (in white). Thanks. • Rodolfo Samonte: GlennBro, PAP, hehehe, and yes absolutely. 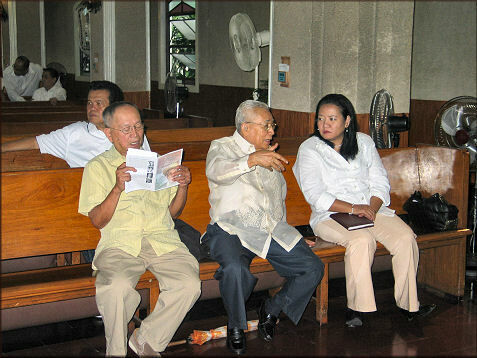 • Pandy Aviado: This happened right after the 86 people pawis rev. Adiel referred to this as the Concerned Printmaykers miting. • Glenn A. Bautista: PaAnoPo, as usual, Pandy & d ladies – they just have to blend . . how’s your magical pandora’s box? 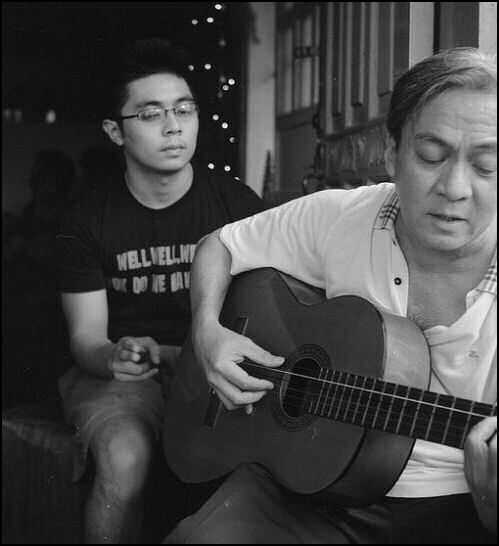 • Glenn A. Bautista: Btw, here’s Glenn leaning on reliable “Pressy“. 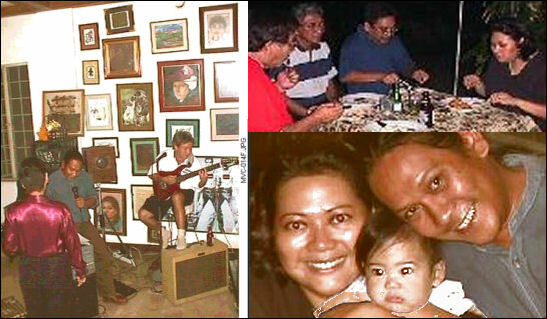 . .
Emily T. Abonal: Glenn – who is the lady beside Ben Cabrera? 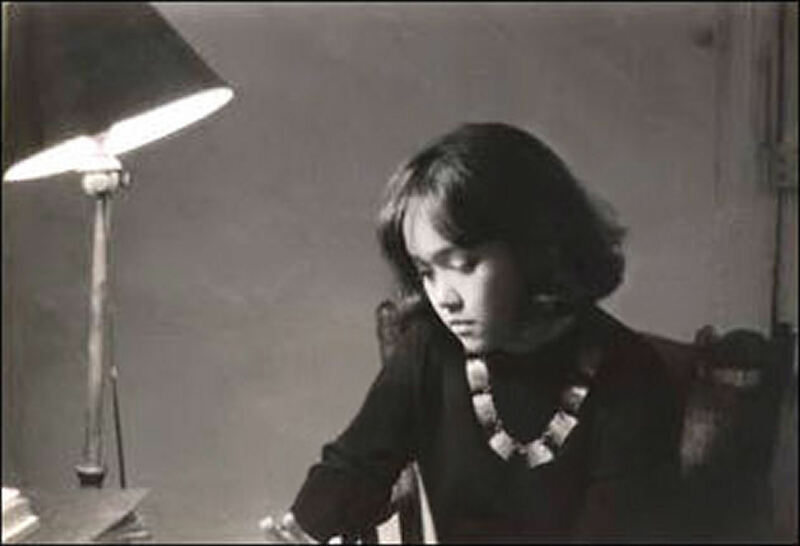 Glenn A. Bautista: Emily. 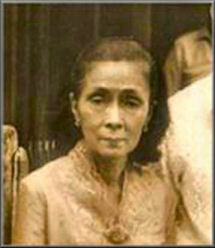 acc to Pandy – between Ben and Adiel is Caridad Arguelles. Next to Adiel on her right is Maida Sobretodo then next is Tess Pasola. Behind Ben is Tony Gonzales, the papermaker. Emily T. Abonal: Yes – I thought so. She was our Art Teacher in St. Theresa’s. Btw, here’s Glenn leaning on reliable “Pressy“. 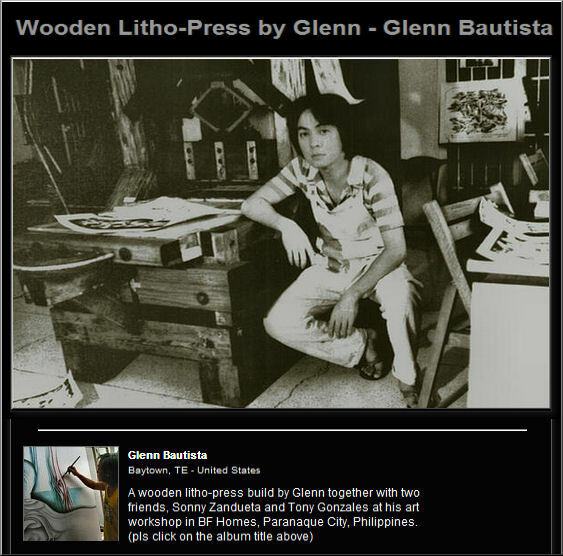 . .
Glenn’s home-crafted Litho-press (“Pressy”), and two lithographs he editioned in Dusseldorf, Germany; one of many lithographs produced in Paranaque, Philippines, making use of available local materials. 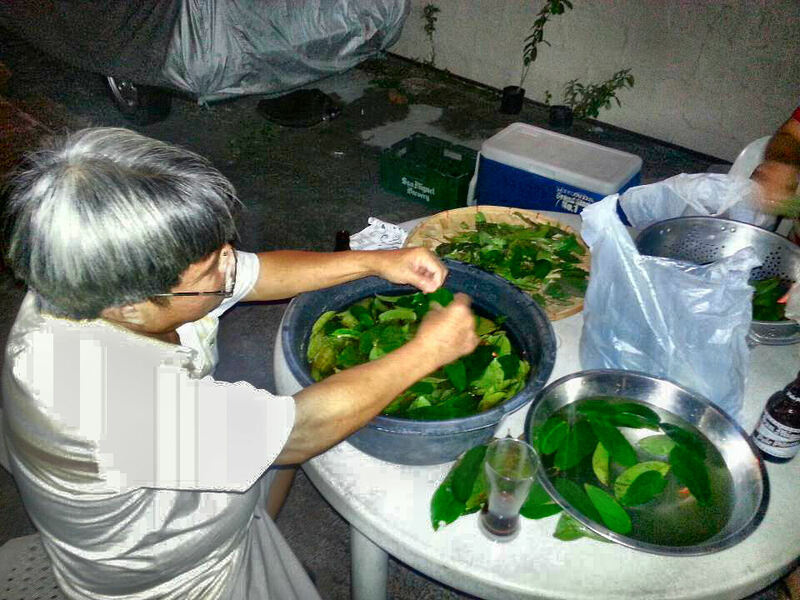 Our youngest brother, Johnny at home preparing my “Graviola Tea Leaves” in Irineville, Paranaque City, Philippines. Thank you, brother Johnny. God bless. From inside garage to David’s Honda. 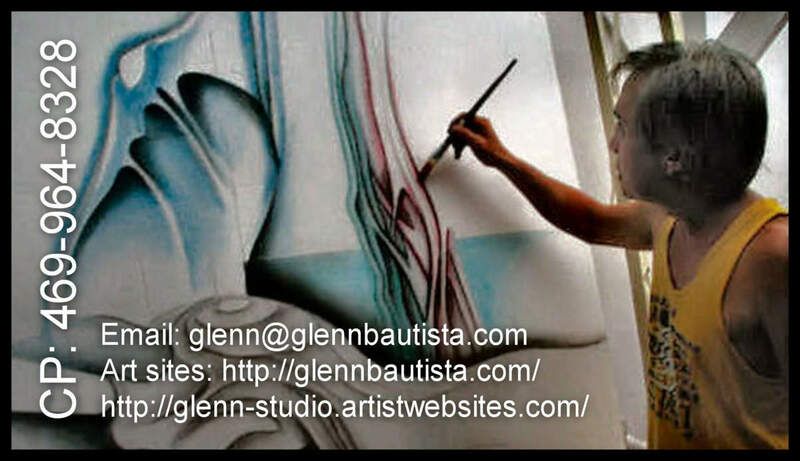 — with David Bautista and 26 others at San Melia – Houston. Erickson A. Sandel, Imelda Angeles Reantaso, Cesar Angeles and 17 others like this. 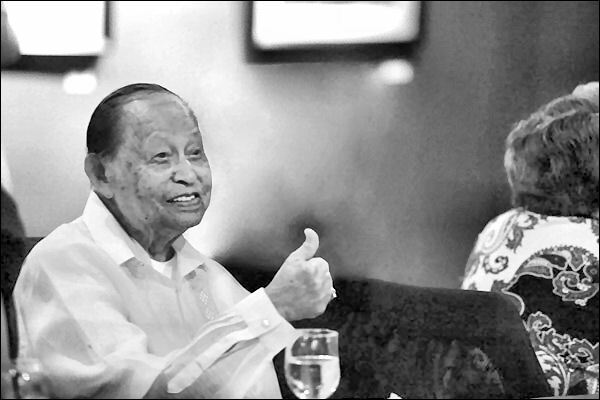 Glenn A. Bautista: Yes, Arthur . . we dearly miss them. Glenn A. Bautista That’s good to know, Arthur . . .
Willie B. Laureano: Two of the Best People I’ve met in my Life. They’re My Grand Pa and Grand Ma. Love Them, Miss Them. 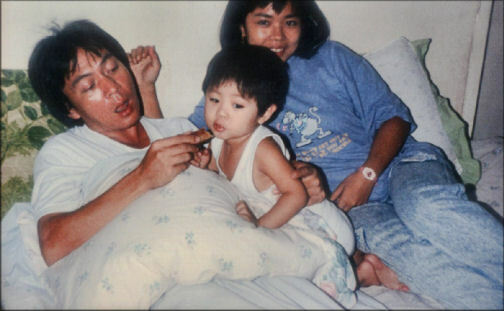 Glenn A. Bautista: Willie, your grandma & grandpa spoke very highly of you when they were around, they found you sweet and caring . . .
Willie B. Laureano: Thank You Uncle. I miss them So. 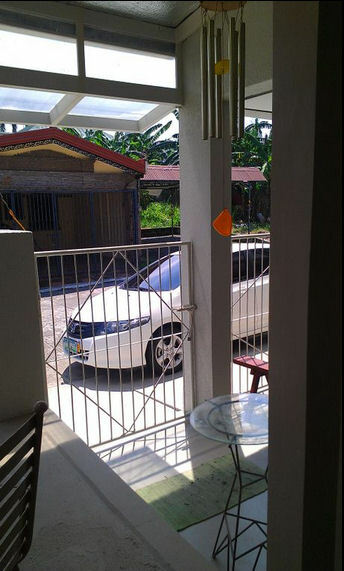 Fortunately, for us in Imus, we are located near a rice field, where the air is fresh and the wind blows continually. Grazing nearby are mooing cattle and goats, while amongst the mango trees, laden with flowers and little green mangoes, are tweeting birds which lend their sweet music to the unused ears of city folks. Our supply of NAWASA water is plentiful, as is seldom the case in some places in metropolitan Manila. In addition, we have a deep well which supplies us with cool, fresh drinking water that needs no boiling, as we had always done so in L.A. for my delicate system. We are all doing fine here, and rapidly adjusting to all our newly-found fortunes in this our beloved land –both climatic, economic, and otherwise; knowing as we do well that our Lord who cares, sustains, heals, and provides all our needs, actively at work in the midst of His people! Glenn A. Bautista: TayNay dancing . . . where was this? 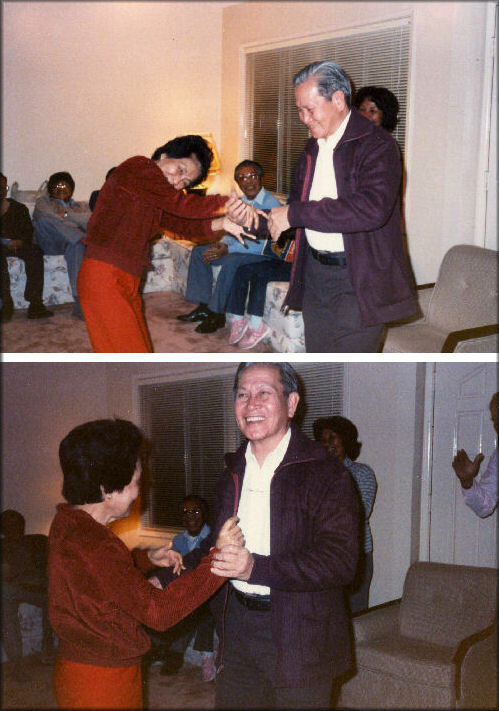 It was in March 1993 when Tatay and Nanay decided to go back to the Philippines for good because they missed being with all of you out there in the Philippines. Evidently, they came back here, sacrificed being away from you, because of what they can still do to help alleviate your situations there.I wrote this then because we would surely sorely miss them too – thinking it would take long before we see them again. 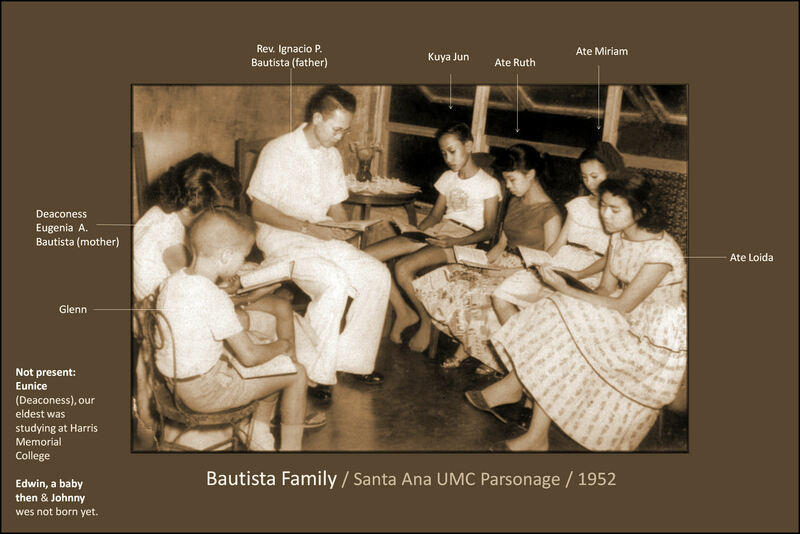 (See attached picture taken at their Azusa apartment).We (which includes Miriam and Carol) then prepared photo albums for them so they won’t forget us here. Through conversations with them, I caught some glimpses of the deep longings in their hearts and am a witness to how they humbled themselves to ask for help for those of you who were in constant need. 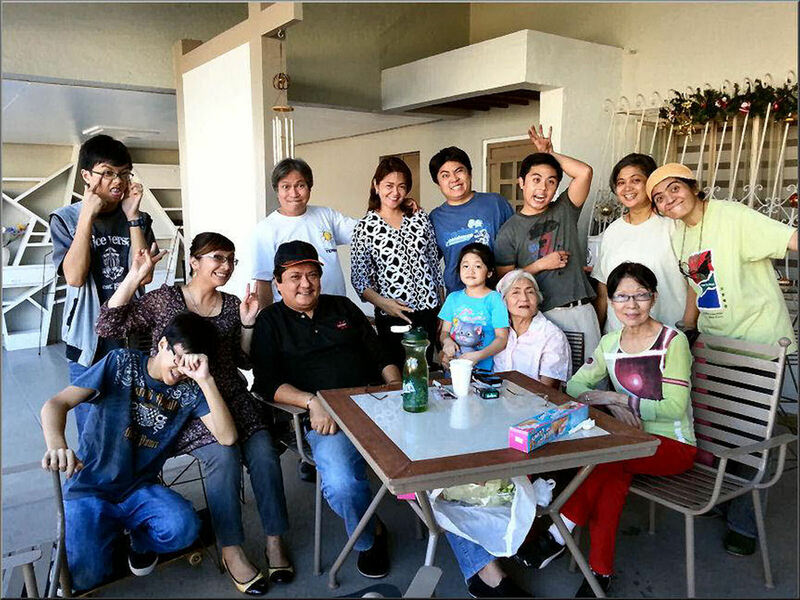 Ruth Lapuz: ok at meron kang pictures nila, cute silang lahat! 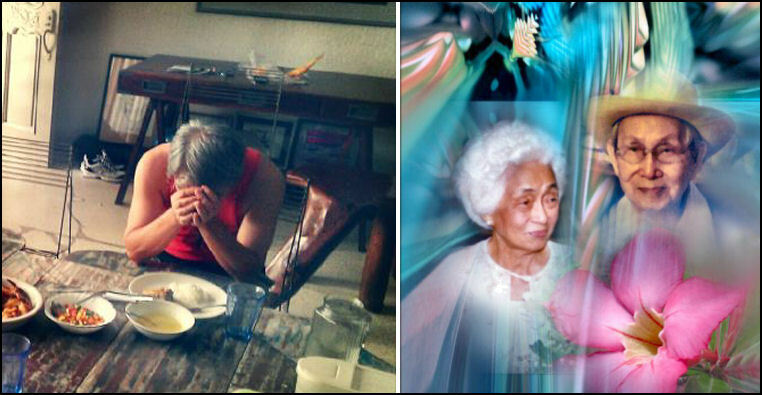 Saphia Rifareal: Happy Grandparents Day to all Lola and Lolo! We miss you and love you! Hoping for reunion take care always and thank u very much for being there with us through your prayers! God bless your hearts! Glenn A. Bautista: Love you, Saphia . . . take care always. Staying there for nearly 2 weeks, I had some free time to go around at the invitation of my Japanese host from KDD, our counterpart telecoms company. This gracious gentleman would eventually become a friend over the years, us communicating by telex, that ‘ancient’ technology. I was immediately fascinated by Japan; the beauty of the place and the culture of its people, it’s art and the sheer beauty of its simplicity, the minimalist and spacious designs…though I barely grasped and fully appreciated its essence at that time. We went to visit some ancient shrines, the foot of Mt. Fuji, and even to experience a tea ceremony. Drinking sake or Kirin beer? Yes! you have to pour it on his cup, and he to yours- even this is both profound…and practical as the drinking spree stops when one feels he’s had enough. Even at that time that I was lacking in ‘wisdom’ I was fascinated by that culture and would keep a continuing interest over the years. We were discussing about Zen and he was describing it as more of a philosophy, a way of life, rather than a religion. When I asked him, “So, bottom line is Zen a religion or a philosophy?” With a wit of humour he answered, “For tax purposes, it is a religion.” Glenn, I’m just so glad there is this unexpected opportunity to re-live these memories with you. P. Gani, in subsequent years I would have the opportunity to travel back to places in Japan; Tokyo again, Kyoto, Osaka, Yokohama, Okinawa, etc. and I was enchanted each time. (By the way, sayang we were not yet in touch when I was sent to Montreal to then meeting host Teleglobe Canada- is it still the name of the co?) In a trip sometime in 1985, I picked up a book in the airport which took my interest; “Zen Way – Jesus Way” written by a long time protestant missionary in Japan and a comparative study of the two world religions. As it would happen a couple of years after, our company sent us on scholarship to a 2-year night school at the Ateneo Graduate School of Business. In a philosophy class term paper requirement, I chose to report on World Religions; Comparative Study of Christianity and (Zen) Buddhism, behind a smart-alecky knowledge that I have that book that I can ‘plagiarize!’ (huwag mo ko sumbong) I have to admit that in terms of understanding the subject, I’m just skimming the surface/at-the-tip of the iceberg. 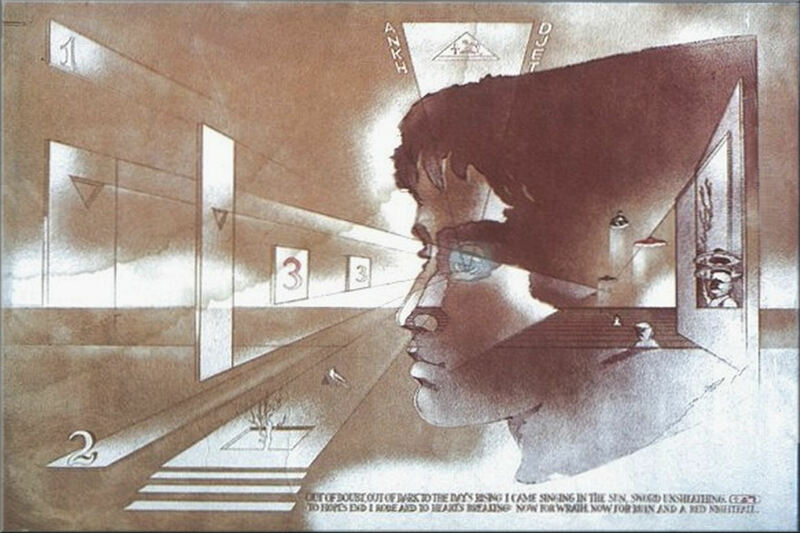 But even at that level of comprehending, I felt that initial fascination brought beneficial understanding of life philosophy. In Zen, philosophy and spirituality is seamlessly embedded in its art, music, rituals, nature, landscaping, disciplines (e.g. archery and martial arts) ordinary-everyday things, etc. One does not have to look somewhere else. It is one. (Remember the prayer…”on earth as it is in heaven”…a non-dual prayer it seems) And the principle of letting-go of attachments…remember ‘someone’ said “he who saves himself shall lose it; he that loses himself, for my sake, shall find it”. These perhaps are too simplistic for the western thought process, however even the famous present day Christian apologist Ravi Zacharias warns of quick dismissal/judgments of Buddhist philosophy. Pareng Gani, thank you for being available for these kind of conversation and making sense of it- nowhere else is this freedom available to me, you know what I mean. Glenn, thanks for sharing. This article will go to my hard disk collection of documentaries, high resolution pictures, and various articles on Japan. I very seldom write this long; so thanks for bearing with me. I must have overlooked your email amongst many . .
BLOSSOM (HANA). . thanks. . I really appreciate being able to share my thoughts with you and PastorG concerning matters that are, likewise, important to me which I cannot readily share and discuss with my casual friends. “Where there are no birds singing, the mountain is yet more still”. 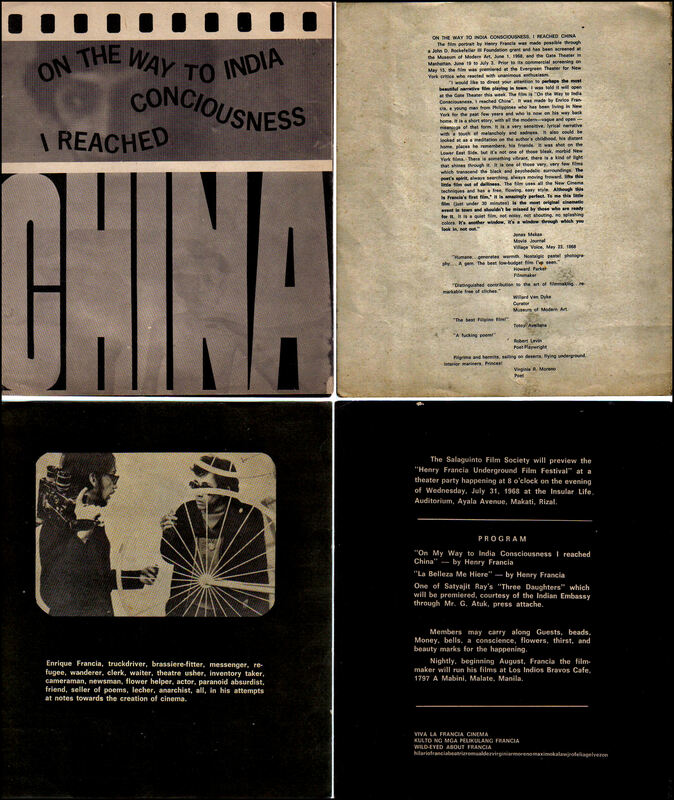 . .
which my professor in printmaking used to quote a lot . . (Brooks Institute – my school ’70-’73 in Santa Barbara, CA) when I was yet an art student under Ron Robertson (he was more Japanese than American). As PastorG would perhaps know about me, this is not easy for me to say, for I did not readily accept my father’s religion, him being a Methodist minister. To cut the long story short, I believe, I am at present by God’s grace, on the right path. PastorG has much to do with straightening my ways. Cancer, too . . has much to do with my present realizations. Nick, I do not know much about you, but I know, you are my friend. Glenn, that Blossom melody is simple and nice. I find myself whistling the tune. It was good of you to share your tribute to your mom and dad. 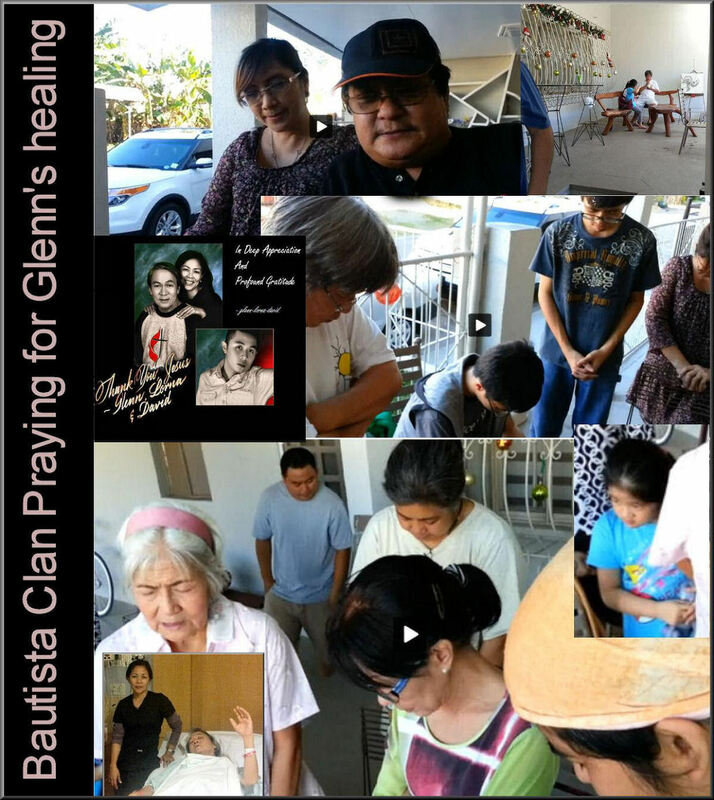 Glenn, do I sense some kind of a re-birth re your spiritual life as a result of your friend PastorG’s influence? If so, care to share it with me? Linda’s cancer is slowly progressing. But still confined to her right lung. Hi Ems, my Dear friend . . I am sad to hear about Linda’s health issue. But, I know, it’s never too late to do something about it. According to my two (of four) oncologists, I only had 4 months to live (that was November 2012) for my colon cancer had metastasized to my pelvis, prostate, ribs/lungs and liver. I weighted 118 lbs. ; I used to weigh 145 lbs. It is now July and I am quite strong and healthy and am back to 135 lbs. After that pronouncement from my oncologists, I stopped chemo (I finished 12 of 14 days of 3 chemo pills a day) so as not to prolong the agony of the treatment’s side effects – – too many and too painful to enumerate. I was supposed to avail of another 6-month more invasive chemo treatment from Smith Clinic, Houston, TX, which I cancelled. I never went to see my oncologists, since then. I prayed hard about my health issues and claimed healing from our Lord and Savior, Jesus Christ. Since then, slowly, I receive daily solutions, ’til now, by way of phone calls from old and new friends, chats and exchanges via Facebook, some of which are cancer survivors. Ems, in brief, depending on the patient and those close to him/her, one can tilt the scale/balance to one’s favor towards healing and good health. I once tried helping the father of a dear friend in CA – – visited the father, talked to the family and got permission from them to avail of what I thought was a good regimen for the father who was suffering from “pancreatic cancer”. To cut the story short, his oncologist did not allow him to avail of my regimen. I knew then that he was still quite strong, enough to recover from his ailment. I recently heard from the daughter that his oncologists had given up on him and that he is now in hospice in a hospital in CA waiting for his time to go. Ems, although the family has accepted the father’s fate and are at peace with themselves, I am, ’til now, really disappointed that they did not give my regimen a try. Well, Ems, I am only a phone call, skype chat away if you need my support. Hope to hear from you. Embrace to Linda. Hi Glenn, so happy to hear you have regained your weight. With your resourcefulness and determination and closeness to the Almighty, rest assured your health is in His hands. You are such a faithful servant to his wishes, he will grant you health and longer life. How have you really been? Yes, let’s just continue submitting to His Will and everything will be alright. Everlasting Life with Him and with our loved ones who have seemingly left us start when we leave our physical body, and that’s quite OK with me . . take care always. 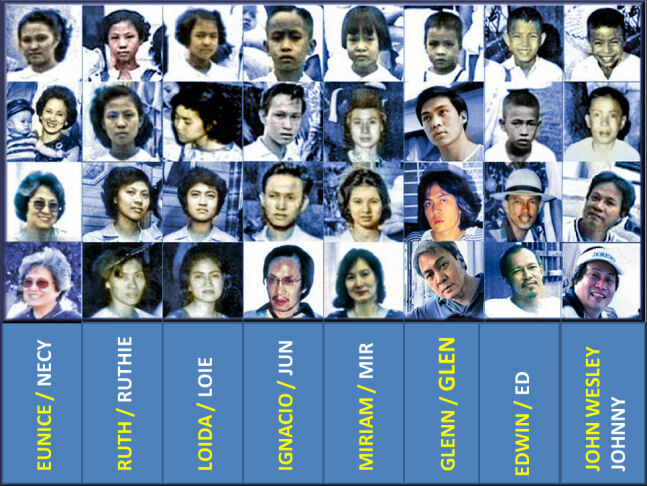 Joann Castrillo, Floreza Gigi Gonzales, Anita C. Ilan, Lcristina Bautista, David Bautista, Cesar Angeles, Joe Rivera, Danny Hernaez, Dan Yves Hicaro P and 19 others like this. Glenn A. Bautista: kamiss cno? . .